This week, like the prior one, is packed with potential tier 1 event risk, both scheduled and unscheduled. It begins Sunday and Monday with a batch of Chinese data which, if the group reflects the same bullish of bearish them, could be collectively very influential, at least in the early part of the week. The next big scheduled event is on Wednesday with the German Constitutional Court’s ruling on Europe’s rescue fund, which could rock markets if the court blocks German participation, though most observers believe it won’t. There’s also an Italian 10 year bond auction, which could be influential if it produces any surprises. Thursday gets even intense with the Federal Reserve’s monetary policy announcement (the likely big event of the week given the stakes). 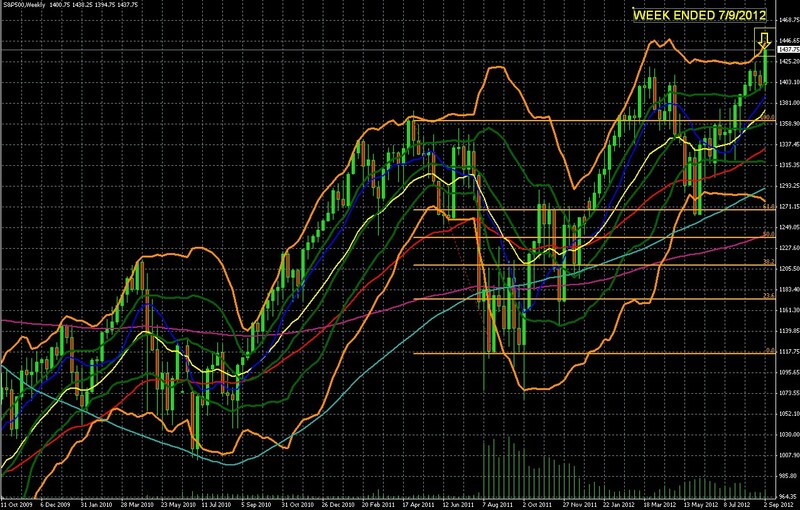 Friday too could move markets, with the U.S. retail sales report and the beginning of the EU Finance Ministers meeting. In addition, now that markets have had time to digest the major events of last week, the latest ECB moves and US jobs data, we could see delayed reaction to these as well. Central Bank policy remains the focus. Both the Fed and ECB appear ready to double their bets on policies that have done little and risk much. Given the low chances for genuine economic improvement in global markets, expect markets to continue to focus on the prospects for government aid, which is seen as the only realistic the only realistic support for higher asset prices, however temporary it may be. Barring opposition from Germany’s constitutional court (deemed unlikely), the ECB and EU already appear set to print money and get rates lower. Key details are missing (surprise! Not). However thus far markets think this news is worth at least a tradable multi-week rally, good enough for now, and just in time with yearend bonus season approaching. China too is embarking on easing mode. So now markets await the Fed’s decision at this week’s monthly policy meeting. Even before Friday’s disappointing US jobs report, the consensus was that the Fed would indeed ease, the only question was, how much? The most convincing argument I read came via Inflation Trader’s post on seeking alpha.com. The crux of the author’s argument was that the best reason against new stimulus was the risk of uncontrollable future inflation, as recently argued in a paper by Dallas Fed Chairman Dr. William White. In his Jackson Hole Speech, Bernanke dismissed the risks as ‘manageable,’ thus rejecting the main reason not to ease. Bernanke’s emphasis on unemployment remaining unacceptably high unless growth started a steady ascent made it clear that the Fed was ready was ready to follow the ECB and PBOC in new easing measures. While in theory both the EUR and USD should suffer from new stimulus, the ECB’s actions are seen as needed for the EUR’s survival, and so don’t hurt it nearly as much as the Fed’s additional stimulus would hurt the USD. Add that to the overall increase in risk appetite from all the central bank easing and the near term prospects for risk assets and currencies remain as bright as those of safe havens continue to dim. Whether the Fed’s action feed last week’s rally in risk assets and plunge in safe haven assets, especially the USD, depends on whether Fed actions exceed or disappoint market expectations. Given last week’s price action expectations are already high that the Fed does something big. For timing short term traders, the lead up to the event will likely see big swings die down in the market as few will want to place significant trades ahead of such an important release. 2. MARKET REACTION TO ECB MOVES: WE DO GET FOOLED AGAIN? This one is all too similar to prior bold EU rescue plans; it just buys a bit of time, and maybe not much of it. As with prior EU rescue plans, we see the same essential flaws, and so expect the same results – a return to crisis. I’ve reviewed the fundamental problems many times before, see especially the following 2 articles: SORRY MARIO, HERE’S WHY THE EU IS FINISHED and 7 CRITERIA FOR DISTINGUISHING REAL EU CRISIS SOLUTIONS FROM FAKES. Basically, it’s the same LAP (Lend And Pray) plan. The parties that might provide this backing, EU funding nations lead by Germany, the IMF (the main contributors are reluctant US taxpayers) won’t provide that without means of strict enforcement of strict conditions that these nations are unlikely to meet (and haven’t done so thus far) without the above guarantees. Even if the GIIPS would accept these conditions (unlikely but possible in time of crisis) they can’t be enforced without the EU becoming the US of Europe and everyone ceding essential sovereign powers of spending and taxation to a central authority. That may well not happen at all, and certainly won’t happen in less than 5-10 years given the details needed to work out, even if everyone were willing to cede sovereignty. They aren’t. The risks that this central body might behave like Germany terrify the GIIPS, and the chance that this authority could be dominated by the undisciplined GIIPS nations terrifies the inflation-phobic Germans. Even assuming all were ready, the EU is unlikely to have 5-10 years before one or more sovereign defaults end the EU has we know it. One of the basic rules of good investing is to avoid averaging down, that is, investing more in a losing investment in the belief that you’ve NOW called the bottom, lowered your cost basis, and will turn a losing investment into a winner. However, that is what the ECB is proposing. The current ECB plan is STILL just another variation on prior failed plans: More GIIPS borrowing when they can’t afford their current debt load, more ECB/ EU/ national bank buying of this dubious crap, making the final default all that bigger. Oh yes there will be strict conditions to ensure repayment. These have yet to work, ever. We see no reason to believe the EU can impose and more importantly enforce conditions on Spain and Italy that it can’t even impose on little Greece without contagion fear. That’s supposed to scare off speculators, just like Bernanke’s promise to backstop US banks calmed markets at the start of the Great Financial Crisis. However Bernanke could print dollars as needed. Draghi can’t, certainly not without risking an exit by the EU’s only primary paymaster, Germany, followed by other funding nations. So if ECB short term GIIPS bond buying is really to be unlimited, Germany and other funders are likely to bolt, and the EZ as we know it dies. Even if the ECB is serious about unlimited bond buying, that can only (supposedly) happen if debtor nations meet the above (as yet unknown but sure to be painful) conditions, which we doubt. When they don’t, the bond buying supposedly stops, the bonds plunge, and the EU reverts to terminal mode. However, if he doesn’t mean unlimited bond buying then when that buying stops GIIPS bonds collapse, (only now the ECB and national banks have even more of this crap on their books and the default is even worse)and the EZ as we know it dies. The reason these institutions have seniority is that they’re using taxpayer money, while private investors are playing with money they chose to invest of their own free will. It’s hard to believe EU and US politicians will accept standing before their voters and saying they must accept losses in order to help fund banker bonuses. Meanwhile all will hope that someone keeps buying the bonds. That’s likely, but only as long as the ECB is able to do so with newly created (and ultimately debased) Euros. All this just sounds like Einstein’s definition of insanity, doing the same thing and expecting a different result. For further details, my favorite pieces on the specifics of the latest ECB plan were from Bruce Krasting and Nomura Bank, see here and here. For my fellow John Mauldin followers, I suspect he’ll have some worthy thoughts coming this week on the topic as well. In sum, we believe the effects of this plan won’t last and markets will again turn fearful within a few months at most, possibly far sooner. If enough traders share the above concerns, GIIPS bond sales could still turn ugly fast, quickly discrediting Draghi’s latest recycled LAP (lend-and-pray) program. As noted last week, Spanish banks continue to hemorrhage cash as Spanish depositors show less confidence in their own banks than the ECB. This might move markets if anti-bailout parties show unexpected strength, though recent polls suggest that won’t happen (making a surprise that much more a potent market mover). In sum, last month’s growth in new jobs was an anomaly AND was revised lower, labor participation is falling as more give up trying to find work, and those who have jobs have seen 0% change in hourly earnings. While this confirms the picture of a struggling US economy, it could also give markets and early week boost from the QE 3 hope trade, as long as that hasn’t already been fully priced in already. China may be slowing, but it’s still the biggest growth machine out there. Data out Sunday and Monday could be bullish for markets as long as it surprises markets. If it surprises to the upside, that is obviously positive. If it’s seriously disappointing, it could attract the ‘buy the stimulus rumor’ crowd, given that China’s recent new easing moves. Last week Greek PM pleaded with the EU to release the next tranche of cash despite Greece’s failing to meet the required conditions. See last week’s article, part 10-11 for details. US: inflation, retail sales, and the UoM consumer confidence reports. EU: ECOFIN and Eurogroup meetings, which could be used as platforms for market moving announcements. Here’s the good news and bad news, integrated with the above fundamental picture. The Bad News: How Much More Upside Can You Justify? With asset prices this high, much of the stimulus news already baked in, little help expected from genuine fundamental economic data, and the overall trend since 2007 still down (the current high is still a lower high than that of late 2007), the odds for much more upside seem limited, especially considering the fundamental challenges we’ve presented above and in last week’s weekly preview. This doesn’t mean we’re due for a sharp pullback (although the EU crisis, fiscal cliff, and high asset prices make it quite possible), but it clearly limits the upside potential and raises the temptation to take profits at the first sign of trouble. Simply put, of the 3 possible outcomes for the near future, up, down, or flat, two don’t justify further long positions. Yet with long term technical indicators bullish, it’s too early to go short, though we’ll be watching indicators on shorter term charts for signs to do so. Risk appetite is alive and well, but there’s plenty of reason to distrust it, and to plan profit taking or short positions on risk assets so that you’re ready when the inevitable pullback comes. Meanwhile we don’t fight the trend, but we’re very cautious about jumping on it now. Unless you believe a crisis is imminent, the more likely scenario is that risk assets are at the upper end of a trading range. At most, longer term investors may consider attempting to place a buy limit orders for new long positions on those pullbacks, or traders may consider sell limit orders to establish new shorts for riding prices to the lower end of the range. The central banks behind the most widely held currencies are all in neutral or easing mode, risking the purchasing power of their currencies and any portfolio with too many assets denominated or tied to these currencies. Just as you diversify by asset class and sector, you also want your assets and income stream diversified into the stronger long term currencies. Few investors have that diversification, mostly because it’s only recently become and obvious problem. There are many simple ways to achieve this to suit a variety of skill levels and risk tolerances. Whether you’re a trader or investor, I’ve got some ideas for you in The Sensible Guide To Forex, just published last week. Thanks to all those who ordered it, feedback so far in both reviews and orders has been very gratifying. My publisher, Wiley & Sons, tells me that the ‘Look Inside’ feature on the book’s Amazon page should be up sometime this week. Wiley was kind enough to allow for an especially detailed Table of Contents, so you’ll be able to get a very good idea of what’s inside just by browsing it, and whatever other parts are available for viewing. At least one forex broker, Caesartrade.com, will soon be offering a free online course for all those who have the book. I’ll be adding a variety of bonus materials as time permits, including a roughly 50 page pdf paper, Binary Options, Pros and Cons, the most in-depth, objective look at how to use this relatively new instrument and whether it’s right for you. 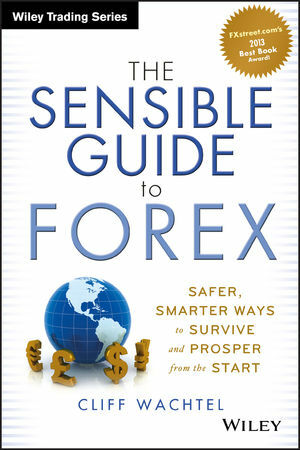 They’ll be available on the book’s companion website, thesensibleguidetoforex.com. If you’ve other ideas on how to let the investing community know about safer, simpler ways to diversify currency exposure, we’d love to hear from you. Really.